What’s it like: You are greeted at the entrance of this brand new hotel by a vibrant living wall draped with greenery that you just can’t resist touching! The restaurant, on the other hand– is nowhere as tropical, with its modern décor made up of marble flooring and simple dark brown leather cushioned chairs. 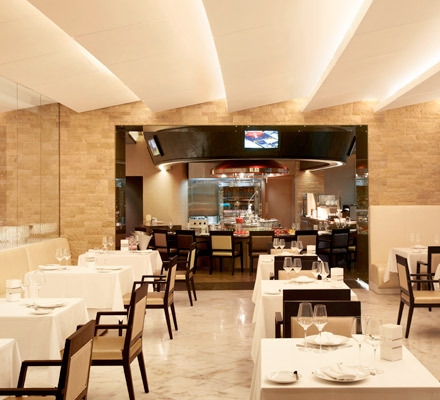 The restaurant is divided into a chef’s table area, a bar to the left hand side, and the dining area to the right. We decided it was time to eat alfresco and headed for the expansive terrace. The minute we sat down, we were offered an innovative amuse bouche of salmon filled with chive cream on vegetable jelly. The menu is pretty concise, but if you can’t make up your mind, head chef Oliver Chaleil will pop by the table to recommend his favourites. I began with a foie gras with port wine jelly, roasted figs, date chutney and brioche, and the portion was large enough for two. The warm brioche melted the foie gras as soon as the two met, and the sweetness of the bread was enhanced by the chutney and figs. My partner had the soft langoustine ravioli which with purple artichoke purée, soya and truffle broth and artichoke crisps, which had a delicate flavour. A meaty pan-seared sea bass with sweet and sour fennel, clams, and zucchini flower with eggplant caviar was my main course, in which all the different elements complemented each other nicely, with the shellfish stock giving the fish a subtly tangy kick. My partner chose the chicken ballotine, crayfish, truffle potato blinis, green asparagus, gravy and verjus. From all the delectable parts of the dish, the potato blinis with the flavour of truffles stood out – a must-try! We decided to share the chocolate variation for desserts which included a chocolate fondant cake, chocolate mousse and a chocolate roll filled with peppermint cream – definitely one for chocoholics! Cheese lovers will also love the variety of French cheeses from the charming cheese trolley which comes rolling by the table, to lure you in at the finish. If you want to go: Around Dhs600 for three-course meal for two, without drinks. Call 04-4556677. Best for: A lively night out with friends.